More than a quarter of the 51 people employed are apprentices at Mollart Engineering’s subcontract manufacturing facility in South Wales. This high dedication to training is part of the company’s programme to develop its own in-house production skills to meet future plans and maximise the gains from the latest developments in manufacturing technology that continues to be established on the site. Mollart Engineering has progressed to become a key supplier to demanding sectors such as the semiconductor industries, medical, aerospace and defence, sub-sea, metrology, nuclear, and oil and gas following an investment of some £4 million over the last three years. Mollart has 13 apprentices at Resolven plus four at the Chessington headquarters, each undertaking three years of training. In addition, a further three from Chessington are post graduates now working on special projects. A further post graduate Howard Mitchell won the AMTRI Scholarship from the MTA in 2013. At Resolven 11 are machinist apprentices including a young lady who is also seeking to gain more detailed experience in inspection and measurement. There is one who is being trained as a machinist, while also specialising in a welding apprenticeship in the company’s recently established welding and fabrication facility. An electro-mechanical apprentice is also being trained and will pursue an electronics career involving the high value assemblies and coolant systems designed and produced at Resolven, as well as electrical panel work destined for deep hole drilling machine build at Chessington headquarters. Part of the shopfloor at Resolven is a designated training zone but kitted out with production machines and normal batch work. This work, plus test pieces, is produced on a newly installed Mazak Quick Turn Nexus 250-ll MY 4-axis turning centre, a Takisawa 3-axis lathe, a Mori Seiki 4-axis turn-mill centre, a Haas 4-axis machining centre and an inspection area with a Romer portable 3-D measuring arm. 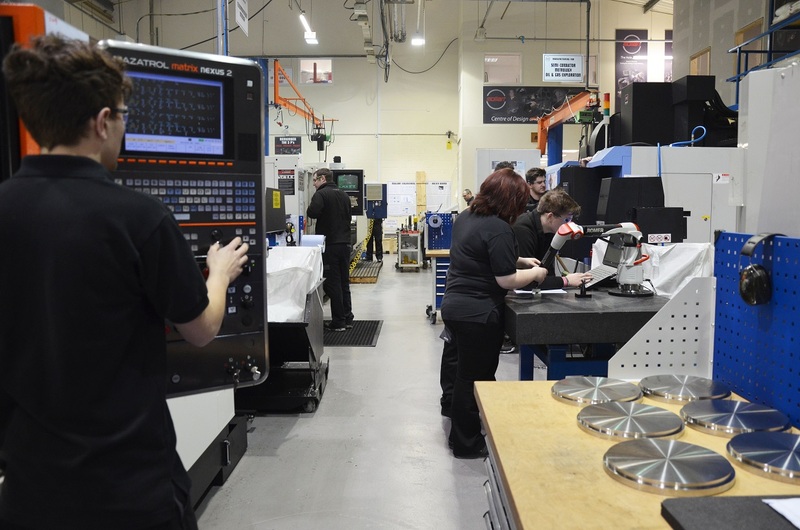 Mollart has also established a strong relationship with nearby Neath Port Talbot College’s (NPTC) School of Engineering, one of the largest further education providers in Wales. The apprentices on Year 1 learn about health and safety issues and basic machine operating skills. For Year 2 they progress into workholding, fixture design and build, and they begin programming and setting machines on the shopfloor. In the third year, Mollart brings everything together and really starts to develop the setting skills. They are involved with more complex machines including the Wenzel CMMs in the quality department, clean-room assembly and work on the SolidWorks CADCAM. The third year apprentices also attend programming courses at Mazak UK and are now working on challenging materials as diverse as aluminium, titanium, Inconel and stainless steels. At NPTC they are working towards the Advanced Diploma in Engineering Level 3 and are assessed on-site and are working towards NVQ Level 3 Extended Diploma in Mechanical Manufacturing/Engineering.